Colour is an effective means for getting a grasp on a lot of information in one place. 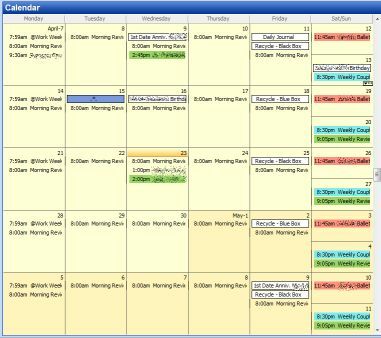 When it comes to your calendar, it can really help you get a handle on your schedule and commitments. 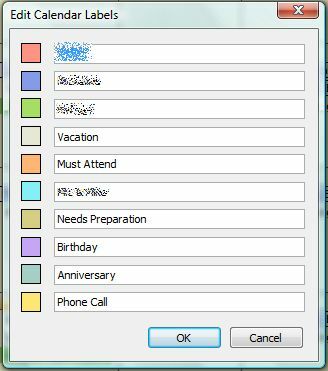 For those people who synchronize with Microsoft Outlook, there is an easy way to add some colour to your life. This works with Outlook 2003 and 2007, and the built-in Palm Calendar on modern handhelds. It could also be implemented on other Palm calendars like DateBk6. First of all, get your Palm and open the calendar application. In the category picker, choose Edit Categories. At the same time, open Outlook, select the Calendar, and choose the menus Edit => Label => Edit Labels. Choose Colours that match on both Outlook and the Handheld, and edit the Labels text to match the category you’re using on the handheld. In this example below, I’d edit the “Phone Call” label to match up with the colour I’ve chosen on the handheld. 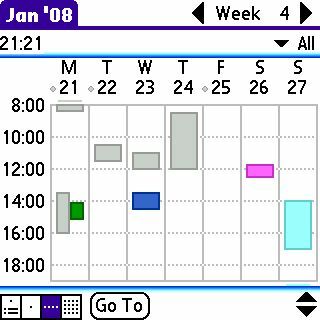 Finish choosing colours for all the Palm categories, and edit the corresponding Outlook labels. Now, here’s where the magic really happens. 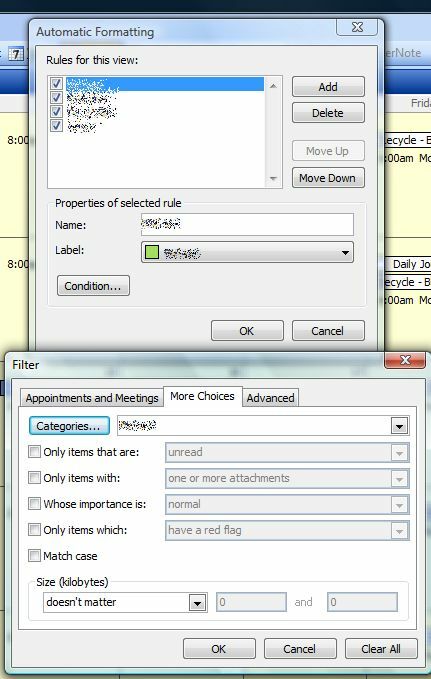 In Outlook, choose the menus Edit => Automatic Formatting. Add a new rule, and call it one of your categories. Choose the same-named label in the picker below, and then click the condition button. Click on the More Choices tab, then type in the name of your category in the Categories field. Click OK when you’re done entering your rule. 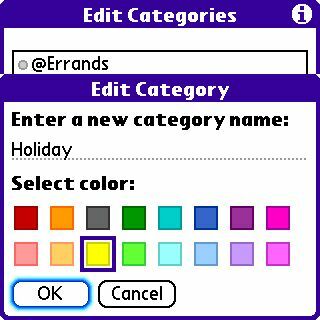 Add rules for each of the categories you wish to colour code. You can also add rules to look for specific text if you tend to use keywords in your appointments. Now, your desktop and handheld calendars are just as colourful and co-ordinated! We’re moved into the new place now, and mostly unpacked. We decided to move ourselves, with the assistance of family, since we had the time and wanted to be able to put the money we would save by NOT hiring movers into something more lasting, like window treatments. We rented a five-ton truck, bought some packing materials, and got to it. My previous moving experiences were moving 200-500 square foot apartments. That didn’t really prepare me for moving 3000 square feet of stuff! I figured it would take 4 guys a day, with two truckloads. Those numbers are probably accurate for professional movers. For us non-professionals, I really underestimated; all of us ran out of steam by the end of the second truckload, and we still had another half-truck left! We’d been at it from 8am ’till 7pm that night, and we were just wiped! We called it a day, and planned on renting a cube van the following weekend to finish up (which we did). We couldn’t have done it without the generous assistance of our family, who really busted their buns helping us move. We’d really like to thank George, Phil, and Michael for all their help. We really appreciate it, and honestly couldn’t have done it without you guys! No, we’re not going to another city or country, so there’s no worries about me disappearing! We’re moving from our current location in the Bank & Hunt Club area to our new location in Riverside South. There, we’ll have more room to grow, and we’ll be better equipped to add new voice and data services as the business grows. That will also be our permanent location, as we’re expecting to be there for the next 20 years or so. How will our moving affect you? Our phone and fax numbers will NOT be changing, as those are provided by our wireless carrier (Bell Mobility). Similarly, our e-mail addresses will also NOT be changing, as those are managed by Solutions At Hand. We’ll obviously have a new mailing address, which will be going out after the move. Mail will be forwarded after the move, so nothing should go amiss. This week we’re finishing up the preparations for the move, getting services installed and operational at the new location, and packing stuff at the old location. Thursday evening I’ll be taking our e-mail server offline in preparation for the move and the transfer of our Internet connection to the new location. This will affect mail to me personally, as well as mail intended for our automated ticket system. Mail sent during the outage will be queued for later delivery when our mail server is back on-line, so no e-mail should be lost during the move. Our Website is hosted externally, so it will not be affected in the slightest by our move. So, this week through to next Monday the 21st I won’t be available for phone or e-mail support, on-site visits, or other sales, training or support calls. I expect that things should be back to normal by day’s end Tuesday, with all services operational and the office un-packed and ready to roll! I appreciate your understanding during this move, and I look forward to being able to serve you better in the coming months. Following the move, I’ll be working on some more exciting new stuff, which I hope to be able to announce by the end of April. Stay tuned for more news to come! For those folks reading my Blog, I won’t be able to post next Monday the 21st, as I’ll be finishing up the move. I hope to have something on Tuesday or Wednesday, so feel free to drop by on those days. Have a great week!